Over the past twenty years, the understanding of the importance of micronutrients in crop nutrition has improved significantly. Once the need for micronutrients in a field has been diagnosed, the historical challenge has been to identify how best to deliver the correct amount of the proper nutrient to the right location at the appropriate time during the growing cycle. A recent trend among fertilizer producers is to add micronutrients to fertilizer to meet the specific micronutrient requirements of varying soils and hence increase fertilizer value. But this process makes manufacturing a quality granule more difficult. ArrMaz has significant experience in solving micronutrient challenges and improving the characteristics of P, K, Urea, AN, AS, and bulk fertilizer blends. 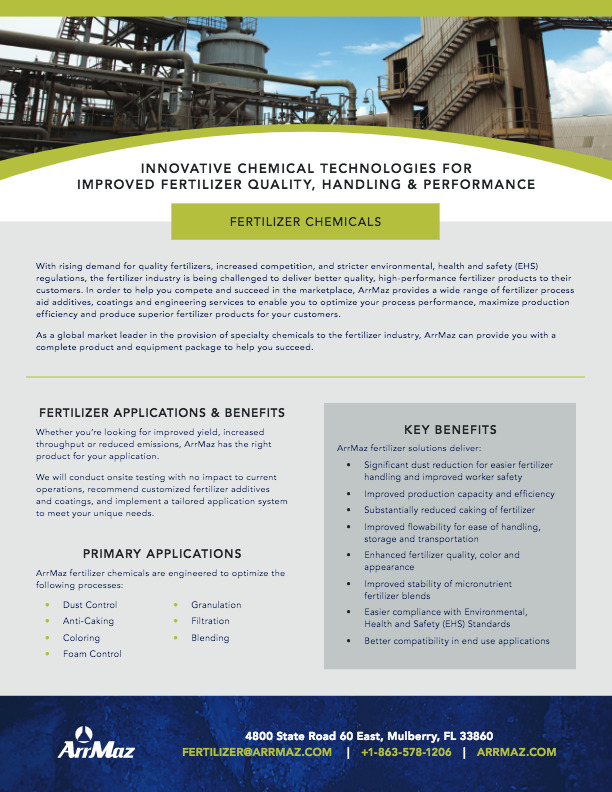 The quality of such fertilizers is even more dependent on process additives such as granulation aids, dust control and anti-caking coatings provided by ArrMaz, as generally such softer fertilizer granules must be fortified with these additives. Segregation is a significant issue when blending micronutrients with fertilizer due to differences in the size and physical properties such as volume, density and shape of the particles being blended. Some of the most economical micronutrients are typically found in powder form. When only a small percentage of a powdered micronutrient is needed for a bulk blend of multi-nutrient fertilizer, and that blend is spread over multiple acres of land, there can be significant segregation of the fine micronutrient particles resulting in uneven application in the field, and unwanted variations in the health and growth of the crop. There are various ways of addressing this challenge in order to get more homogenous distribution of the micronutrients in the fertilizer and thereby, to the field. One way is to attach the micronutrient powder to the surface of the base fertilizer or fertilizer blend using some form of adhesion. This adhesion needs to be robust enough to withstand the application equipment without having the micronutrient powder abraded and separated from the granules, but it can’t cause plugging of the fertilizer applicator. ArrMaz’s Microstickers™ coatings are micronutrient binders engineered specifically for this purpose which produce stable micronutrient fertilizer blends for up to 90 days. This technology provides consistent, uniform micronutrient distribution on fertilizer surfaces, enhanced color and appearance, and dust suppression characteristics. Microstickers technology has been used successfully for more than 10 years, particularly in the Brazilian market, where severe micronutrient deficiencies in the soils of the vast and increasingly agriculturally important Cerrado region are being addressed successfully. ArrMaz will work closely with you to assess your production plant needs, conduct micronutrient fertilizer blend formulation development and stability testing, complete engineering design and equipment installation, and provide ongoing technical support to optimize blend performance.